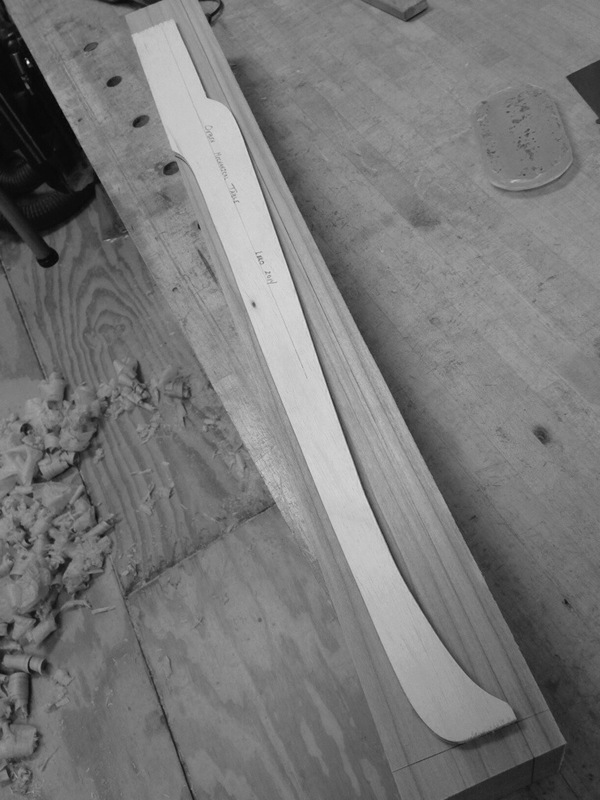 As with any cabriole leg, it begins with a pattern. From where this pattern originates is a mystery at least to me. I’ve consulted with several folks, but no one seems to know of a good design reference on the subject. The best I’ve found to date is the information provided in Jeffrey Greene’s American Furniture of the 18th Century. In this case, I am fortunate to have pictures of the Oeben, both from the Getty’s website, as well as from my time with the original. With this photo, and knowledge of the leg height, I have everything necessary to re-create the profile. Simply project the image onto a sheet of paper with two marks representing the height of the leg, then trace! The profile is symmetric, being cabriole, so this single profile can used on both sides of the leg blank without concern. Many thanks to the ladies at The Arts Council for allowing me use of their projector for this exercise. Leg profile on template stock. Now, it’s a straight-forward exercise in coarse, medium, and fine…Begin sawing out the rough profile, then refine it successively using rasps, scrapers, files, and sandpaper. The resulting profiles should be smooth, continuous curves without noticeable discontinuities. As I work, I’ll run my fingers along the edges while looking away to test. It’s easier to feel imperfections. To refine the template, use rasps, scrapers, files, and sandpaper. With the template “faired”, choose stock for the legs. 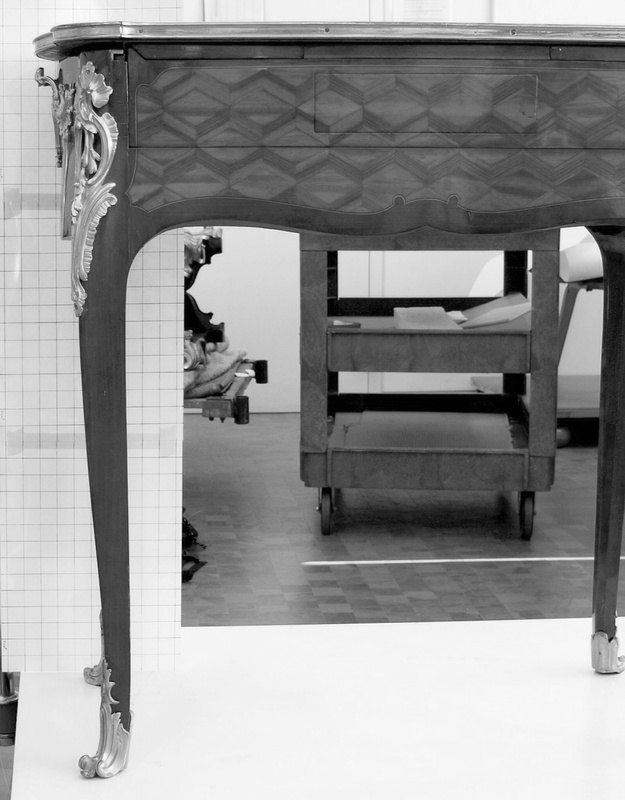 The legs of the Oeben table are completely veneered, so none of the “core” grain is visible. 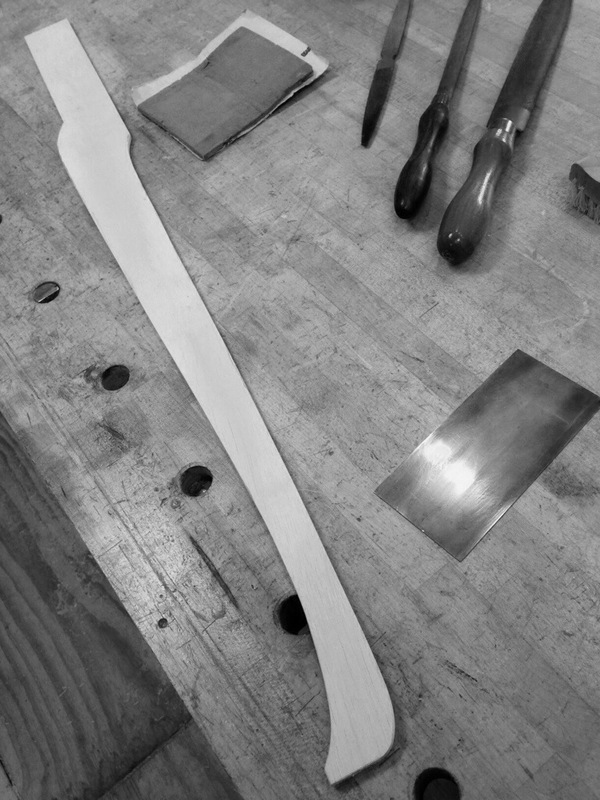 If, however, you aren’t planning to veneer your piece, consider the grain direction of your blanks carefully. Lines running diagonally through the end grain will yield straight grain down the legs. Lines parallel to the faces in the end grain will produce bull’s eye patterns at the knees. Mill a face, and a perpendicular edge. Don’t bother with the other two sides. They’ll be removed in subsequent steps. Just be certain to use these two reference faces for all of your layout. Trace the template profile on two adjacent faces of the leg blank. Trace the template onto the blank aligning the “back” along the arris between the two reference faces. The “back” is defined to be the flat portion of the leg block at the top which winds up inside of the piece. You’ll have to flip the template over when switching faces. I like to strike lines defining the top and bottom extents of the template, and carry those around the blank to aid in alignment. Another point I neglected to make in my previous posting on the legs, it’s best to layout, and cut the mortises while the blank is still square, before you commence cutting. This entry was posted in Discovery, Planning, Prototype by J. Leko. Bookmark the permalink.